Proportional representation can better reflect the messy, complex reality of collective self-rule. 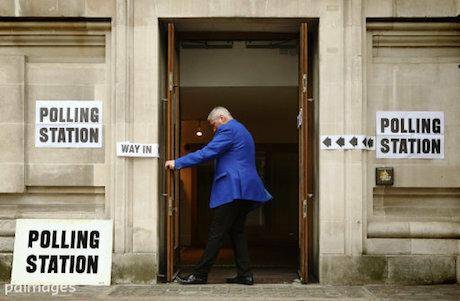 A polling station opens in Westminster, London. Photo: Dominic Lipinski / PA Archive/Press Association Images. All rights reserved. The question of Electoral Reform rears its head at every Westminster election. In order to design the best electoral system, we need to ask: what is democracy? What are we trying to achieve when we ask how to do democracy best? I would argue that we are trying to achieve not simply majority rule but collective self-rule, and that proportional representation (PR) can do this much better than the first past the post (FPTP) electoral system currently used at Westminster. FPTP has come under deserved fire because the number of MPs that a party gets under this system doesn’t tend to reflect the number of people who voted for them. A lot of support bunched together in one place carries more weight than the same amount of support spread across the UK. FPTP is, at best, made for a two-party system of forced choices. We don’t have one, and we should be happy about that, but we need another voting model to support the multi-party system we do have. Proportional representation (PR), where seats are awarded according to a party’s share of the vote, is often suggested as an alternative to FPTP. PR is more representative than FPTP, and this itself is a compelling reason to support it. However, to cast the argument purely in these terms still equates democracy with majority rule. If we adopt a more expansive vision of democracy as collective self-rule, this argument for PR does not suffice. But there are other features of PR that speak in its favour, indicating that it’s better equipped than other electoral systems to offer us the possibility of this second, more robust vision of democracy. These features may seem like obvious points - but in practice, they are often ignored. When I say that democracy is collective self-rule, I am partly making a claim about what I think democracy should be, and about what it often spectacularly fails to be. However, this interpretation of democracy is grounded in its history. The self-rule principle, though tragically not the practice, goes back to the roots of modern democratic thinking, in the English civil war and the American revolution. It’s why there are constitutions: the point is to ensure that you’re not just doing what most people want; rather, but respecting everyone’s autonomy; thus, the constitution guarantees that some things that cannot be done to individuals even if the majority of people want them to be done. The most obvious example is the case of minority rights; a majority shouldn’t be able to vote them away. A white majority shouldn’t be able to vote to that a black minority can’t attend university. Why collective self-rule? Because there is such a thing as society, and this is a good thing. Therefore, we have to make quite a lot of our decisions together. This raises the question: together with whom on which issues? These goals are not woven into the fabric of the universe and can change, as the recent referendums on Scottish independence and the UK’s EU membership remind us. The questions of ‘who’ and ‘about what’ are also raised in the perennial discussions about the balance of local versus regional, national, UK-wide, and EU-wide power. Right now, I’m making the more general point that democracy is not only about autonomy. It is about respecting each individual’s equality within an inherently social context. For instance, some things, like the provision of healthcare, need to be done collectively in order to work. No individual has an inherent moral right to power over another, so we all get an equal say in working out how these things operate; we all should have an equal seat at the table where government is worked out. I suspect that majority rule is sometimes practically necessary for collective self-rule. There are times at which we must all agree to abide by the decision of the majority. For instance, where a clear majority of the overall population has voted for a particular party, that party should be in government, even though this doesn’t give them carte-blanche. In a referendum, questions should be carefully considered so as to reflect the concerns of the populace; this will be better done in a more politically engaged society. Nonetheless, once this is done and the vote is cast, I think you do have to go with the majority of the electorate, where there is one. (This is not necessarily to advocate referenda by simple majority of votes cast; proposals to require a majority of the electorate and/ or a majority large enough to be stable have merit – but these seek to fulfil, rather than undermining, the principle of majority rule). So, I’d acknowledge that when people disagree, going with the majority can be a necessary, if imperfect, mechanism for breaking a deadlock. However, democracy should not be reduced to a social contract to submit to majority rule, even with legal constraints preventing the majority from doing anything too horrific. It should involve trying to find consensus together, taking into consideration each other’s main concerns. I want to suggest that proportional representation can foster this type of democracy. Democracy should not be reduced to a social contract to submit to majority rule. Proportional representation is very likely to lead to coalition; in which the make-up of parliament reflects votes across the whole political unit for which parliament speaks. In such situations, if there is no overall majority, it is difficult to work out who is in charge. This is an argument frequently put forward for first past the post: that it enables strong, stable government. There are two problems with this argument: firstly, it suggests that the ideal is simply to impose majority rule as forcefully as possible. Secondly FPTP often ends up imposing the rule of a minority, albeit a significant minority, of voters. So, behind the ‘strong, stable government’ defence of FPTP lurks the idea that a false answer about who should be in charge is better than an unclear answer about who should be in charge. Reality is messy. We need to live with that. The oversimplification of democratic will that happens in a FPTP parliament is mirrored in constituencies. Constituencies can be hotly contested and deeply divided, but whoever gets the most votes, even by a fraction, simply represents them. This imposes a false homogeneity on constituencies. One argument in favour of FPTP is that it takes places seriously – each constituency does get who the largest number of constituents vote for, and these constituents then have a strong, clear link to their MP; unfortunately, it also treats each place as a cardboard cut-out. In each constituency, the winner takes all and the myriad losers are obliged to shut up until the next election. PR can stop this happening at constituency level. It can also make it much less prominent at parliamentary level, where the true diversity of each place will be better represented. PR will enable minority voices to be heard, and give them a seat at the table. Adam Ramsay, reflecting on the lead up to the Scottish Election, rightly notes that, thanks to Holyrood’s more proportional system, the various parties are doing “more than appealing to an imagined centre”. PR will also lead to coalitions. It will lead to compromises. It will lead to representatives having to talk to each other to work out what to do. It will foster a messier way of making decisions, but a way that is messier by virtue of being more honest. Even where PR does elect a majority, it will be a smaller majority, required to work closely with the rest of parliament and beholden to its electorate because it is much more likely to lose its majority. Whereas FPTP rests on a false majority that only, at best, represents a narrow middle masquerading as consensus, PR represents the breadth of public opinion and obliges it to seek a true consensus. There are two caveats, often foregrounded by critics of PR. Firstly, in coalitions, large parties often make common cause with smaller parties, to inch themselves over the 50% threshold. In practice, this can drag the policy aims of the first largest party further away from those of the second. For instance, if the Tories made a coalition with UKIP this would take them further from Labour; similarly, if Labour made a coalition with the Greens, this would take them further from the Tories. To be clear, the government formed in such a case would be no less democratic than the government formed when one party commanded a majority; it would still be made up of the same number of elected representatives. The potential problem is that the government’s compromise position would not be a consensus position. Maybe, instead, the two largest parties should just team-up as a matter of course? This has its own problems. If you’re not making a coalition based on shared ground, you are destined to make a nonsense of manifesto promises you can’t guarantee you’ll be able to propose. This brings us to anti-PR caveat number 2. Don’t all coalitions risk manifesto promises to some extent, leading to backdoor deals, so that the politics of a PR parliament is unrepresentative, even if its politicians aren’t? Doesn’t this also reduce accountability? One way to guard against both of these problems would be to have guidelines preventing policies that a clear majority of voters rejected. For example, suppose the Tories make a coalition with UKIP. Under such provisions, they would not be able to incorporate into their coalition agreement a 5 year moratorium on ‘unskilled immigrants’, this not being in the manifestoes that most people voted for. The erosion of manifesto promises is, nonetheless, a risk of coalition government, and therefore of PR. I’ll acknowledge that the erosion of manifesto promises is, nonetheless, a risk of coalition government, and therefore of PR. I think it is a risk worth taking partly because manifesto promises aren’t binding anyway, and regularly aren’t kept under the current system. PR might well fail to solve this particular problem with British democracy. But it wouldn’t create it. What would mitigate this problem is a more participatory democracy; a representative democracy where everyone engages closely with parliamentary politics, and seeks to hold parliament to account, is a good start here. It’s not going to happen while people believe that their votes simply don’t count. PR can make them count. Much of this points towards a greater focus on parliament than on government as a locus of power. PR plays to the genuine strengths of parliamentary democracy in which a patchwork, cross-party legislative body represents the people. The government comes together out of that, as the group most likely to command a consistent majority, but it doesn’t have power to pass laws without involving all the representatives of the people. PR accentuates the discursive, consensus-focused aspects of this process in a way that gets a lot closer to doing justice to a diverse population seeking answers to genuinely complex questions. PR allows the electorate’s real diversity to be reflected in parliament, and fosters their serious engagement and negotiation between diverse perspectives. It won’t, of course, ensure that we will always make good decisions; nor will it be sufficient to solve all other problems that encroach on our democracy, such as corporate power and the influence of big media outlets. It will empower us for collective decision-making and promote a more politically engaged society, and that will help us tackle those other issues.